Corso Fiorito – “San Remo in Bloom”. This event was so successful that it was held year after year and it also gave rise to the “Battle of Flowers” in which several floats were entirely covered by flowers. After the war, the parade was called “Italia in fiore” (i.e., Italy in bloom) and was accompanied by bands and folklore groups. 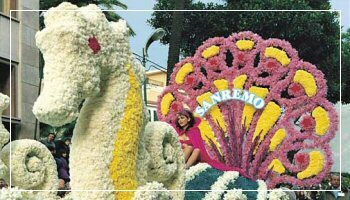 Thanks to this parade, San Remo thus became the Town of Flowers par excellence. Nowadays the Corso Fiorito is one the most important events in San Remo and certainly the most eagerly awaited. The preliminary phases last for several months, then everything happens in one single night: from sunset to dawn the floats flourish thanks to the skill of the people who prepare them. Thousands of colourful flowers create marvellous compositions: faces, dresses, animals, clouds, stars and scenes, all created from flowers. When the moon gives way to the break of day, the floats are ready. The feast can start. And the town streets are thus full of life, enlivened by the music of the bands that accompany the parade every year.